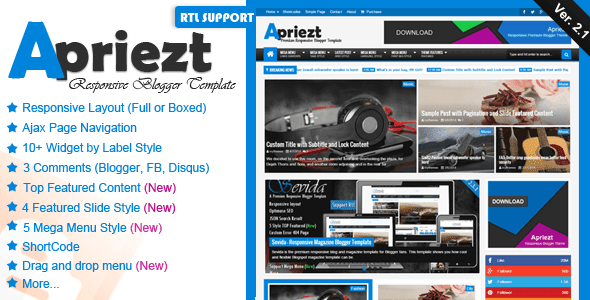 Apriezt v2.1 is a Responsive Magazine News Blogger/blogspot Template. This Blogger Template has awesome layout and two view styles such as Boxed and Full width. This Blogger Theme is High User Friendly web-design and its design is simple and clean that is surely perfect for Magazine, News, Personal Sites or Portfolio websites. This Template comes with an attractive color combination and fully user friendly layout style that surely impress professional webmaster and developers. Download previous Version Of This Blogger Template Apriezt 1.2 – Responsive Magazine/News Blogger Theme. 0 Response to "Apriezt v2.1 – Responsive Magazine News Blogger Template"